As we drove up to the East German border in 1983 we were both somewhat nervous--but excited, too. This was the first time in 31 years that Hans would be back in his Heimat (homeland) since he had left as a boy of 14 with his aunt. 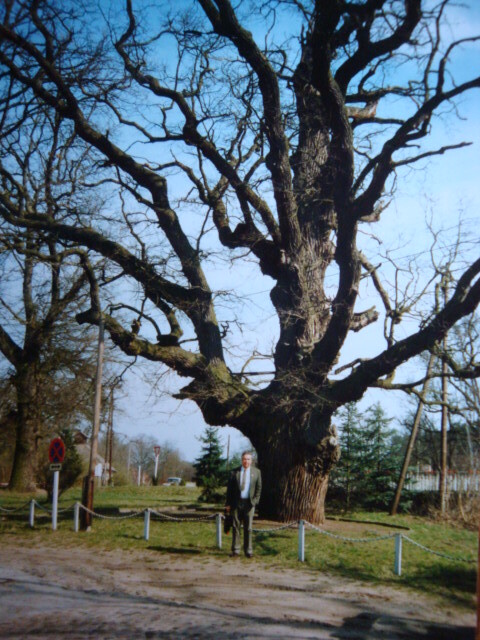 Hans had been born in Magdeburg but had grown up beside the Werbellinsee, a beautiful lake in the Schorfheide forest area in the State of Brandenburg (about 100 kilometers from the Oder River, which is now the German/Polish border). 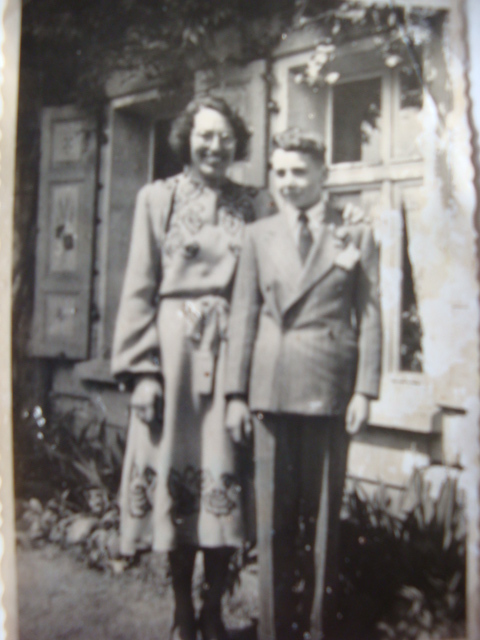 The picture below is of Hans with his Aunt Gerda in 1952, a few months before escaping from the DDR (East Germany). 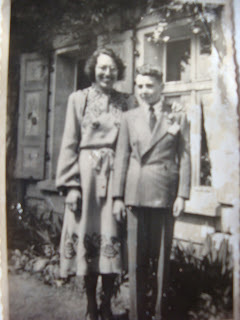 His Aunt Gerda--his mother's sister--had brought him up after both his parents had died: his mother in 1943; his father, in 1944. In an attempt to escape the Communist country, Hans and his aunt had been caught and jailed for about two weeks. His aunt--who had become his mother--was forced to do the cleaning in the jail and in the Russian barracks. Hans was allowed out during the day but had to return for the night. On release, they had been threatened with "Siberia" if they were caught again attempting to escape. A short time later they did try again, flying by chartered plane at night into West Berlin (with the help of an influential friend). It was 1952 and this time they made it safely. A few months later both would emigrate to Canada by ship, entering Halifax at Pier 21 in December of that same year (1952). That was followed by the long train trip west to Westlock, Alberta, to where his aunt's son Heiko had already emigrated to work on a farm. (In those days, to enter Canada, you had to have a sponsor, or you had to agree to work on a farm or another work place for two years where hard work was required. This Heiko did and then sponsored his mother and Hans.) Three years later, in 1955, Hans joined the Royal Canadian Army. He retired officially in 1983, which meant that he could at last, as a civilian, return to the Heimat he had never forgotten. I was privileged to accompany Hans on that journey into the East. 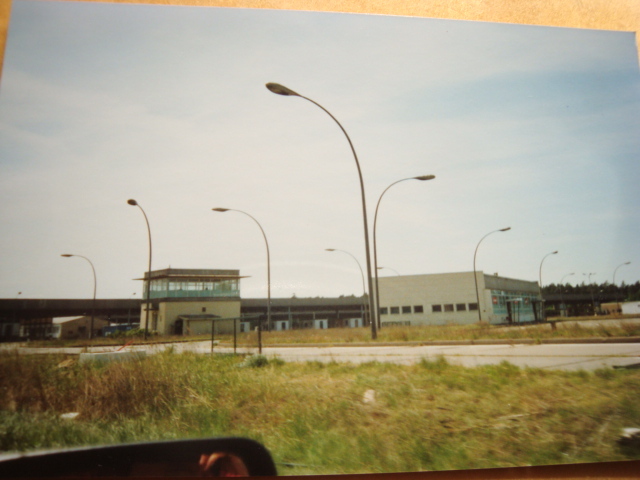 On that day in 1983 I became more nervous as we started going through "no-man's land," leaving West Germany behind. We had to go through three check points, giving up our passports at the first one and not having them returned until the final check point. All I could think was, "What have we gotten ourselves into?" I feared we might never see our passports again and thus would never get back to our side of the infamous Wall. We were entering the communist Deutsche Demokratische Republik (the DDR) or, as we called it in the West, the German Democratic Republic (GDR). The picture above is of that same border crossing. The moment we arrived on the other side, it was as if we had entered a different world. The grayness is what first was so noticeable: the meadows were green and the sky was blue, but the towns and houses were gray and rundown, as everything had been neglected for so long. We found out later how little money people had and how difficult it was, even with money, to buy such things as paint and building materials. The entire infra-structure was in total decay. The picture below right is of a former mansion in ruins; no money nor materials available to keep it up. 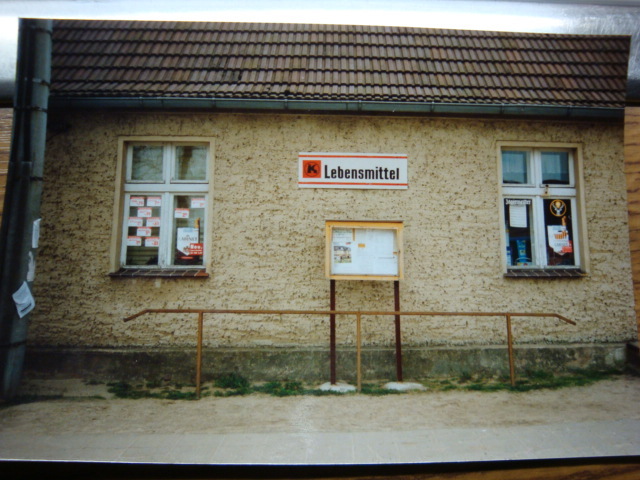 We had had no choice in where to stay while in East Germany. The Communist regime chose the Palast Hotel for us in East Berlin, a luxurious hotel where only people from the West were allowed. 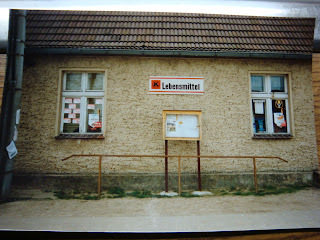 There, we could buy a West German newspaper and shop in the grocery store, for which we were later thankful. (It was off limits to the local population.) 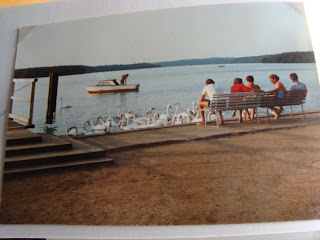 Each day we paid Deutsch Mark 60 (West German Marks) for a visa to drive out to the Werbellinsee, which was situated just 50 kilometers northeast of Berlin, to Hans' former home beside the lake and to visit the surrounding area. We drove the 1000 kilometers to East Germany in an Italian Innocenti mini and were amazed at the reaction it received. Our car was identified by the Canadian Forces Europe (CFE) licence plate as we were part of the civilian work force with the Canadian military in Europe. We had, as well, the Canadian flag emblem on the rear of the car. Passengers in other cars, mostly Trabants--better known as Trabis--often waved out their windows as we or they passed, yelling "CANADA!" in their excitement. 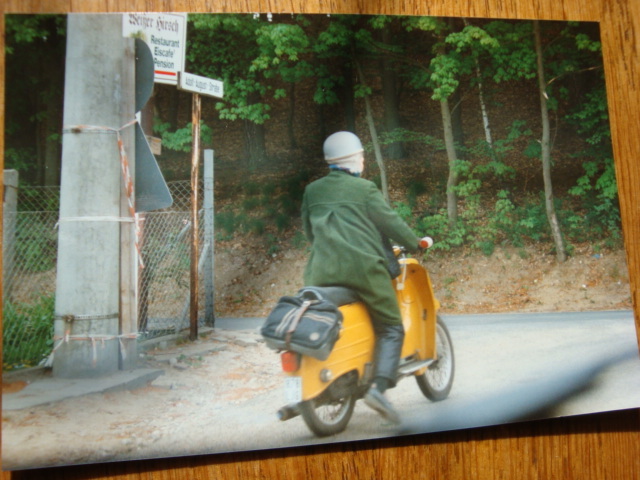 The picture at left above is of our mini on highway 109, which comes out of Berlin heading northwards. It was the only highway we saw that was in perfect shape and with painted white lines. 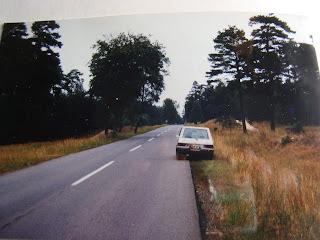 The reason for this was that Erich Honecker (Head of State in East Germany) had a country home farther along this highway. We were told that it was kept up so that he would think all the roads were like this one! At a parking area one day a young man shyly approached us and said, "My wife's dream is to have a car like yours someday." Our mini was not at all luxurious, which was the reason we had taken it up there, thinking it would not attract much attention. We were told by several others later that one had to wait up to fifteen years for a car with the money put up front first! Few could afford that. Secondhand cars were more expensive than new ones, if such a vehicle could be found. 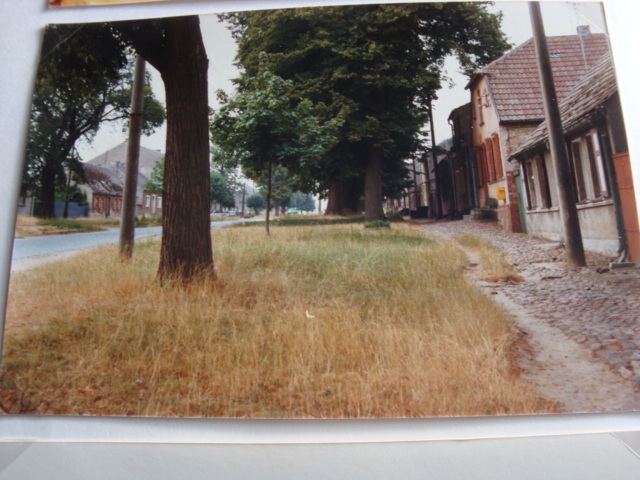 By West German and western European standards, the traffic was almost non existent. That at least helped to make up for the terrible road conditions: highways and country roads were atrocious with potholes or uneven cobblestones that shook and rattled our car--and our bones! The Autobahns, which had been built during Hitler's era, were mostly of pre-World War II vintage with little done since then to repair them. 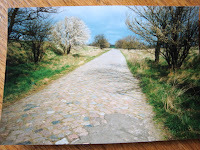 Once beyond the Berlin city limits--where our visas were checked leaving and returning each day (we had to be back within the city by midnight)--the countryside was peaceful and lovely. 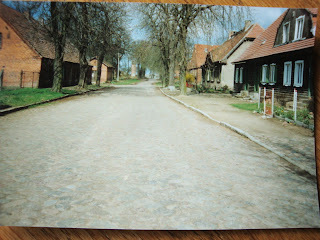 Small villages lay just beyond the Autobahn and seemed to be part of yesteryear--which, in fact, they were. 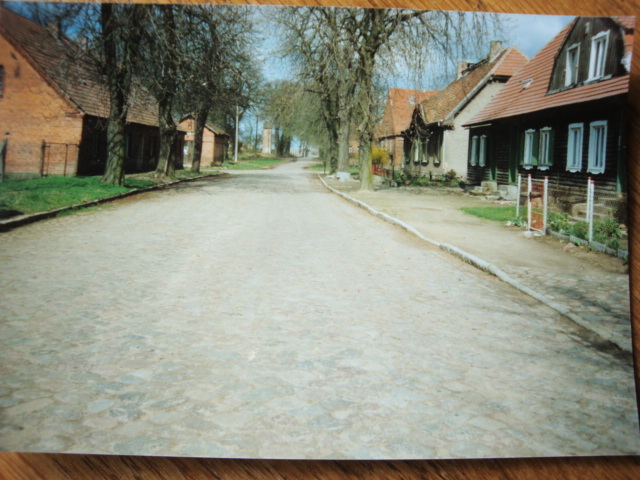 This is a typical quiet village with cobblestone road and sidewalk. The most exciting part of the drive was arriving at the Werbellinsee, a lake 33 kilometers long . Hans' house was at the far northeastern end of it. He remembered every landmark, every curve in the road, including--it seemed to me--every tree! The oak tree at the right is over 600 years old, some say as old as 800 years. This is in the town of Eichhorst, close to the Werbellinsee. The house, situated across the road from the lake, included the land on the lake side as well as acreage behind the house and a large piece of the forest--about four hectare total (ten acres). The house had been bought by Hans' grandfather shortly after World War I. (He had been a shipbuilding engineer for the Imperial Navy during the Great War.) We found out later that the title to the house was still held by Hans' aunt. 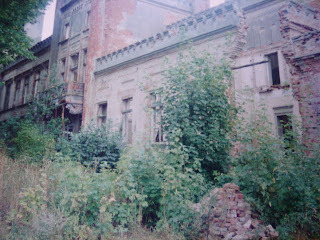 In many cases, houses had been taken over by the Communist state, but fortunately theirs was not one of them. That would prove to be hugely important after re-unification. Hans' house is shown below. What a surprise it was to find that Hans' best friend, Werner--from school days--lived in the house, as did two other families, including his cousin Heiko's best friend, Wolfgang, and Wolfgang's in-laws! 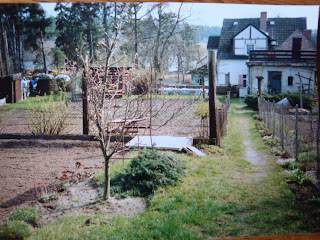 When we stopped across from the house that first day, Wolfgang was outside in the garden. He stared at us and at our car and then yelled, "Hans-Jörg!" He had recognized Hans after all those many years. 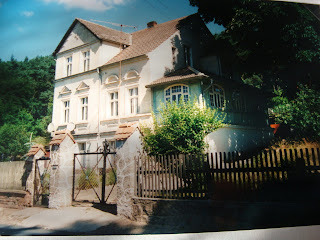 We found out that the two friends had done what they could to keep the house in a reasonable state of repair during those Communist years, one of the reasons the house appeared to be in better shape than many others we had seen. When Hans lived there it was a one-family villa, with a gardener and a maid. At the end of WWII and during the Communist era after the war, he and his aunt and his grandmother--who died before they escaped to the West--looked after it without any aid. This picture shows the rear of the house and part of the garden area. The lake can be seen beyond the house through the trees. Surrounding the Werbellinsee--"a jewel amongst lakes," wrote the famous writer, Theodor Fontane--is the Schorfheide, the largest integral forest in Germany today. Much of it is now protected by UNESCO, with 25,000 hectare (750,000 acres) of jack pines, beech, oak and birch trees. The Schorfheide has been the home of many famous and infamous individuals, including Prussian King Friedrich Wilhelm IV, Kaiser Wilhelm II, Reichsmarschall (Air Marshal) Hermann Göring and Erich Honecker, the last East German Head of State. The Schorfheide, a beautiful forest area with many lakes, is just an hour or less from Berlin, making it a favourite haunt of many, including weekenders from the city. 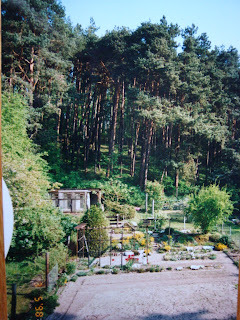 The picture on the right shows the back garden of the house and the forest beyond it. Each afternoon one of the families in Hans' old house invited us for coffee and cake and told us about their lives. One afternoon Hans and I went for a walk in the forest with Wolfgang. When talking about politics, his voice lowered to almost a whisper: "The Stasi (secret police) are everywhere," he told us, "and you cannot trust anyone except for your family and close friends." Though we were the only ones there, it was almost as if he thought the trees were listening! The region was close enough to Berlin to receive West German television signals; although it was against the law to watch western TV, many did. That meant that the people could see what life in the West was like compared to theirs. One young couple we met told us, "Our dream is to visit Canada. We feel marooned within our own country. We can travel to the Eastern Bloc countries but those countries do not really want us or our East Marks." One of the reasons they were so poorly off in the DDR was that most of the best products from East Germany went to those other East Bloc countries, including the Soviet Union, making much unavailable within the their own country. 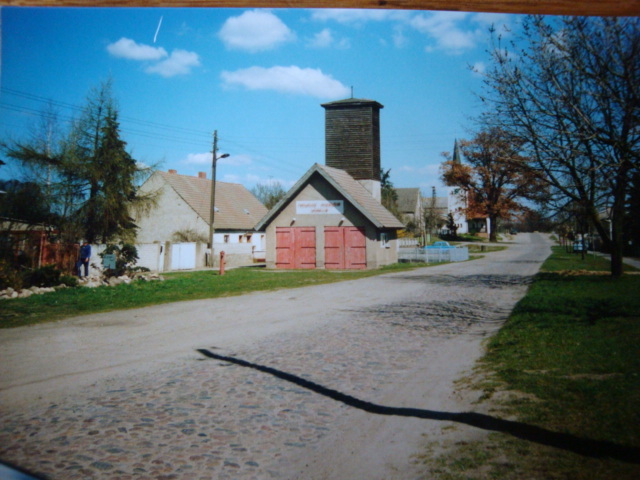 A simple grocery store at left. It was almost impossible for the ordinary people to buy those consumer goods we take for granted, such as citrus fruit, walnuts, decent coffee, chocolate or cocoa, for example. Other products were so expensive the common person could not afford to buy them: colour or even black-and-white TVs (which most did have), stereos and cars. Ordinary goods such as winter boots and coats cost half a month's salary. We visited the families many times and on each subsequent visit we took supplies with us for Hans' friends, ones that we bought at the hotel in Berlin (always including coffee!). After that 1983 trip, each year at Christmas we sent each family a parcel of food products until the Wall fell in 1989. We found few Gasthäuser, but those we did find served very good home-cooking style meals. They always had three items on the menu from which to choose, each in a different price category. Usually we managed to get the last one offered, invariably the most expensive one. The prices were extremely reasonable (for us), perhaps about East Mark 5, equivalent at the time to about Canadian 50 cents. Some Gasthäuser were open only to Communist Party members and we were told in no uncertain terms, when we tried to enter, that they were out of bounds to us. 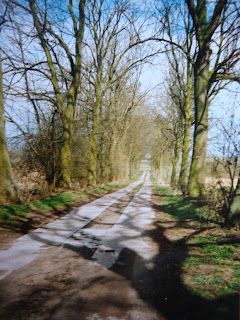 Two typical country roads, quiet and peaceful, but bumpy! We drove down many country roads and into many small villages. Grocery stores carried mostly the basics with fresh produce from the area. The only flowers we saw were the ones in gardens; we never saw a florist shop or nursery. Police were everywhere. Many roads in the vicinity of military areas were off limits to us and to most locals as well. Once away from the grayness of the border and city, the countryside was beautiful and tranquil. Although houses had no paint and were often in bad shape, they added to the feeling of an earlier era. With few cars around and fewer stores, it was quiet and peaceful, though we wondered how we would manage living in such a closed society and country. I always felt the lack of freedom while we were in the DDR and truly realized the difference in our own lives when we were finally back on West German soil. The moped was a typical way for getting from place to place. Below, the small, quaint village of Werbellin, just off the Autobahn in the Schorfheide and close to the lake. Time stood still here. Below, the Werbellinsee at the southwest end, just outside Altenhof. A typical past time for many, including us: Watching the swans. We saw a lot on that trip and found it to be emotional and thought-provoking as well as rewarding. It had been a memorable journey. We had hoped to go back soon again but bureaucracy, increased costs and a busy life had deterred us. 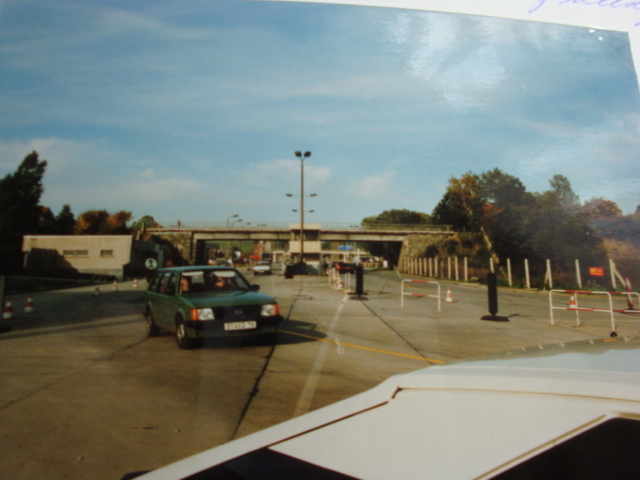 But three days after re-unification, in October1990, we drove back again, the first of many such visits after the Wall had fallen. 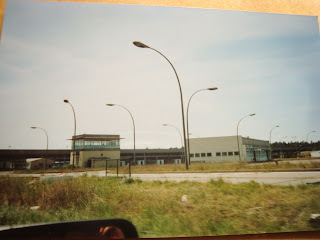 A Note: All the photos were snapshots taken in 1983 except for the two border crossing pictures, taken in 1990. I then took pictures of all of them with my digital camera. I kept a journal of our visits to the Werbellinsee, thus the reason for the conversations still remembered and our impressions at that time. I plan to write about our 1990 trip and a little from other trips there, showing the changing times. I so enjoyed reading all of this. It was so interesting for your husband to have this trip back to his childhood. It reminded me of when we took the troop train from Frankfurt to Berlin Christmas week, 1968. Passing through Checkpoint Charlie...we were shocked at how gray everything was in East Berlin compared to the West. It was a shocking difference. Thank God the wall is down!!! Hello Susan, I know I answered this but it wasn't posted as a comment. Thank you so much for your feed-back. Though the Wall came down many years ago now, thankfully it did!